Each e-mail message in your inbox demands your time and attention. Filters and rules are great for reducing some of that demand, shunting easily defined mail such as e-newsletters and personal notes to their appropriate folders. But important e-mail messages are often hard to define and organize with automatic, rules-based management. They require filters and rules that reside only in your brain. The key to managing these important messages is to evaluate each one for the response it requires and then quickly convert that evaluation into action. What follows is one such system (based in large part on an approach suggested by productivity guru David Allen in his excellent book Getting Things Done ). Your particular work and e-mail volume may dictate some changes to these basic ideas, but they’re a great place to start. For unread and unprocessed items only. For messages requiring only short responses that can be ticked off in five minutes or less. You’ll periodically go through this folder and send off those quick responses. For e-mail that requires anything beyond a quick response—work, research, or a detailed answer. 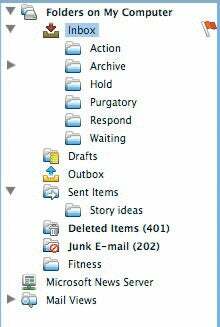 Reduce your folders : Cut down on the amount of e-mail folders you have, and define each by the kind of action that the messages inside it require. For items—such as new login information and package-tracking URLs—that you’ll want close by in the next few days; prune weekly. For mail that’s likely to require action when its sender gets back to you. For anything you want to save for future reference. This is where you can put all those subfolders for particular projects or topics that you’re probably using now. But with all the search tools available in today’s e-mail clients, you may even be able to do without those. For spam, junk, and anything you’ll never need again. With those folders in place, going through your inbox means focusing on the action each message requires. If it requires action, either do it now or put it in the right folder for deferred action. If not, archive it or delete it. Whenever you’re in doubt about where to file something, ask yourself whether you can just respond or act immediately. Like a short-order cook, you want to stay focused on making sandwiches, not on putting the orders into pretty piles. If you can knock off a reply the first time you see a message, do so. But if you accumulate items that need a bit more attention, concentrate on getting them all in the right place, and then go back to your work—return only when you have time to start chipping away. Above all, don’t let unprocessed mail live in your inbox: this is a lazy habit that invites procrastination, guilt, and inaction. Adjust your timing : Stop checking your e-mail every five minutes. Instead, set your e-mail client to check less frequently–ideally, every hour. A surprising number of people set their e-mail programs to check for mail every minute. That’s building 500 interruptions into each workday. As a quick experiment, look back over your last two weeks of e-mail and count the messages that absolutely required a response in less than sixty seconds. My guess is that you won’t find too many. The key, then, is to retrain yourself. First, adjust your e-mail program to check for new mail once every hour. (In Mail, that setting is in the General preference pane; in Entourage, it’s in Tools: Schedules.) If an hour is just too long, you can try something like every 15 or 30 minutes (See “Adjust your timing”). Then start batching your e-mail work into hourly “dashes” of 8 to 10 minutes at a go. You can use that time to sort new messages, send the replies you can, and then get out. Finally, when you do respond to your mail, keep your answers as concise as possible. Don’t sit on old mail because you dread crafting a long response. Just keep the ball in motion by clarifying, asking questions, offering help, or even saying “I don’t know.” You can always write more later. The point of all this is to stay focused on doing just the work each message requires. That, in turn, means less time treating e-mail as an end in itself and more time using it as the tool that it is.